Someone commented on my menu a few weeks ago suggesting I make BBQ Chicken Pizza. Well, I tried it, and the whole family loved it. Easy and so good! We made our favorite garlic pizza crust recipe, then topped it with our favorite homemade BBQ sauce. You can also use store bought crust and BBQ sauce, we just like our homemades better. We then topped it with mozzarella cheese and cooked chopped chicken. We also put onions on some. That was good. I think I’ll try green bell peppers next time, too. The crust in the picture was made with half white flour and half whole wheat flour. 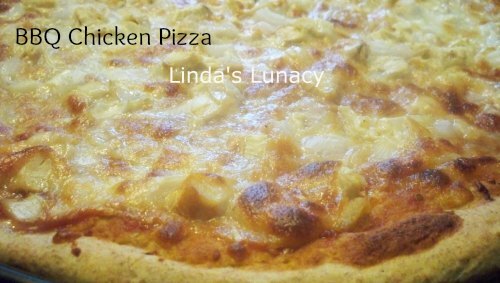 The chicken doesn’t have to be cooked in BBQ sauce as the sauce on the crust has plenty of flavor. But you good it in bbq sauce if you want a bigger bbq punch. When your cooking chicken, just cook an extra piece for the pizza. Cooked chicken can be chopped and frozen. Then when your ready for pizza, take it out to thaw. Makes pizza night even easier. There is no recipe to print out. Just get the number of crusts you need for your family, a bottle of BBQ sauce, 1/2 to 1 cup of cooked chopped chicken for each pizza (amount needed depends on the size of the crust), and a package or two of mozzarella cheese. That looks yummy! Friday night is pizza night in our house. I feel like I always make the same kind every week so I am going to have to try this. I bet it would be great with a mix of mozzarella and sharp cheddar. ummmm….this sounds interesting. I bet it’s good. I like your ingredients, but have not heard of it being in a pizza form…..thanks for sharing. That looks so good!! I remember Pizza Hut carried something like this a few years ago and I LOVED it. I’m going to try this for sure!! We love BBQ Chicken Pizza and make it at home about once a month. This post is making me hungry! I can almost smell it! YUM!